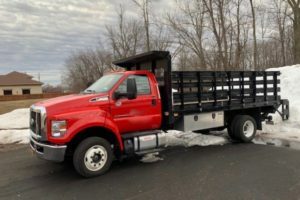 We bought a new stake body truck for our deliveries and now we need someone to drive it. At the warehouse by 6:30 am, you load your truck for that day’s deliveries. You’re always there on time because at any one of a half-dozen job sites 30 or 40 guys might be waiting on the materials and equipment you’ve got in your truck. It’s 8:45 and you’ve seen three locations so far. The supply house has a box of screws that was overlooked earlier. By lunch, you’ve dropped off the screws and loaded a scissor lift to take back to the shop. On the way, you help operate a broom and a shovel because they are shorthanded. Your manager wants you to organize the warehouse, so you hurry back to do what needs doing and prep for tomorrow. Will enjoy a certain amount of autonomy and uncertainty in their daily to-do list. Will have a work history where they’ve demonstrated reliability and integrity. If this truck driving job calls to you—or even if it doesn’t and you’re looking for something else—call or write to me because we have a lot of things happening right now.